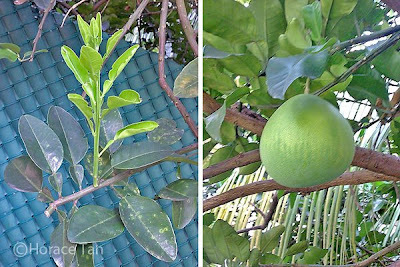 Caterpillar Host Plants: Citrus maxima (Common Name: Pomelo, Family: Rutaceae), Lime species (Family: Rutaceae). 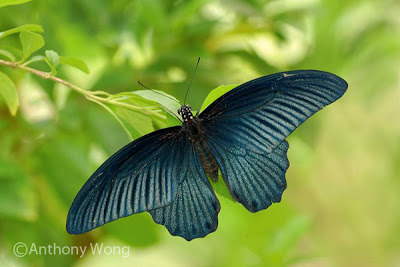 Great Mormon is a large butterfly with a wing span of up to 135mm. 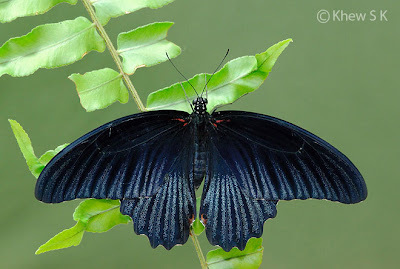 Above, the tailless male is black dusted with bluish green, and below it has red tornal patch and red wing bases. Female is polymorphic with both tailed and tailless forms. 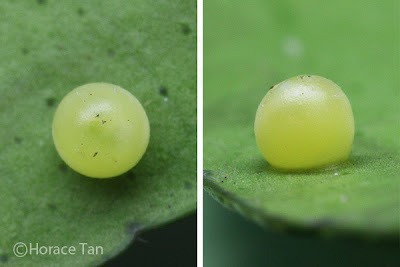 The female forms -f. esperi, -f. butlerianus, -f. agenor and very rarely -f. ityla are found in Singapore. The commonest form is -f. esperi, which is generally similar to the male except that it has a white subapical patch on the forewing. The rare -f. butlerianus situated in the tornal area of the forewing and the red markings on the underside of the hindwing are more extensive. A male Great Mormon perching on a leaf. 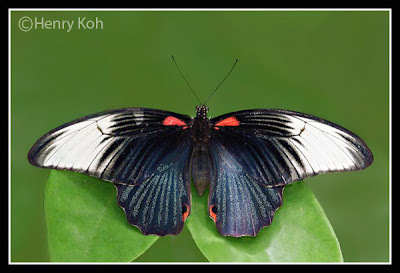 Locally the occurrence of this species is restricted to the forest area in the Central Catchment Nature Reserves as well as on offshore islands like Pulau Ubin and Pulau Tekong. The adults usually fly rapidly at tree-top height, except when they come down to feed at flowering bushes or to look for oviposition sites. 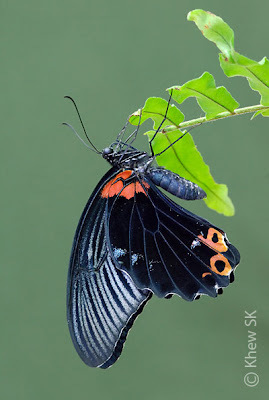 Like many of the Papilio species, when an adult stops to feed at flowers, it flutters its forewings while its hindwings are kept relatively still. The local host plants include the common lime species and the Pomelo (Citrus maxima) which is a cultivated plant. As members of the Citrus family, the leaves of these host plant have a pleasant aromatic smell when crushed or when broken at stalks. 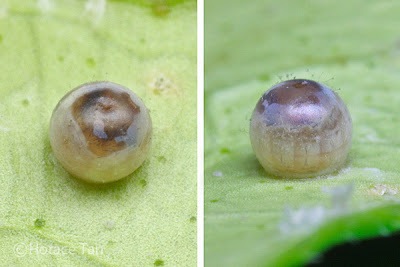 The eggs of the Great Mormon are laid singly on undersides of leaves of the host plant. The egg is pale creamy yellow with a finely roughened surface. It is nearly spherical with a diameter of about 1.8mm. 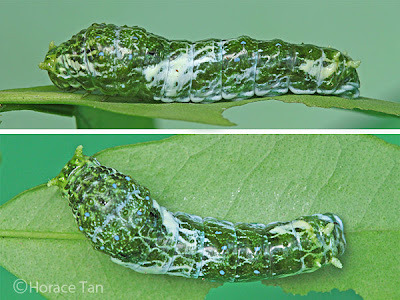 As the 1st instar caterpillar grows to a maximum length of about 7.5mm, the dorsal whitish patches changes to yellowish brown. There is a faint whitish saddle on the mid-abdominal segments, and white markings on the prothorax and posterior abdominal segments. 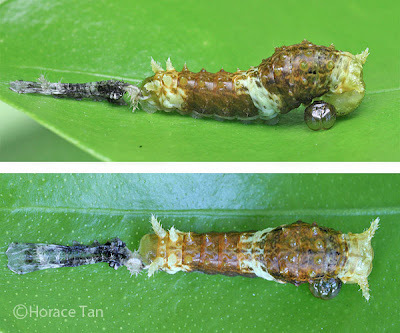 After about 3 days in 1st instar, the caterpillar moults to the next instar. 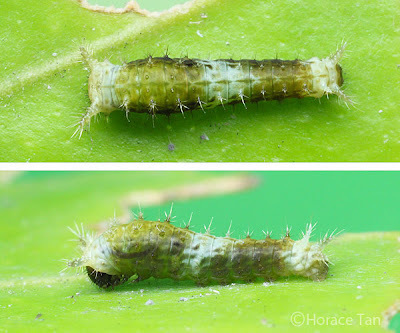 The 2nd instar caterpillar has a similar appearance to the late 1st instar caterpillar except for the more distinctly white markings on the anterior, middle and posterior body segments. This instar lasts 2-3 days with the body length reaching about 10mm before the next moult. 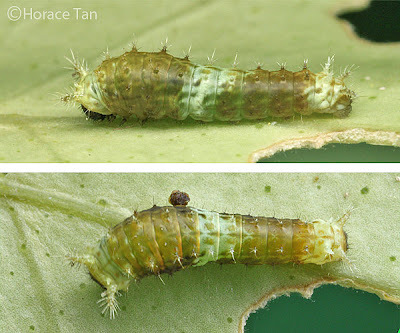 The newly moulted 3rd instar caterpillar bears no drastic change in physical appearance except for more dark brown to black patches appearing on the mottled body, and the more distinct white saddle mark. The brown coloration gradually changes to yellowish and dark green as the growth continues. 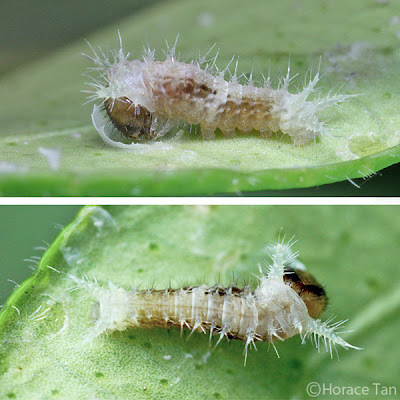 This instar takes about 3 days to complete with body length reaching 20mm. 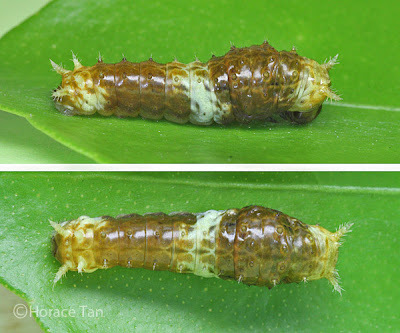 The 4th instar caterpillar resembles the late 3rd instar caterpillar initially but with a more slimy appearance. As growth proceeds, the cryptic markings of light to dark green intermingled with white streaks becomes increasing mottled. 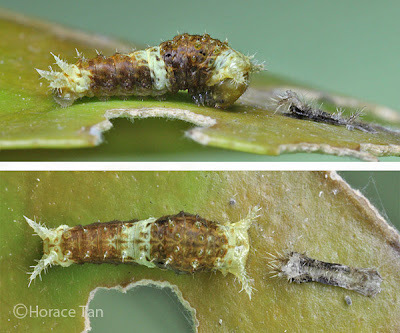 This instar lasts about 4 days with body length reaching about 30mm. Now the shield-like thorax is very prominent. The eye spots on the 3rd thoracic segment are connected by a transverse green dorsal band with sinuous markings. A similar band occurs between abdominal segments 1 and 2, and features pale bluish gaps between the sinuous markings. The first oblique bars, one on each side, run from the base of abdominal segment 3 to the top of segment 4. The second oblique bars occur at the two sides of abdominal segment 5, wide at the base and tapering to the dorsum. Both sets of oblique bars are mainly whitish dotted with tiny greenish and bluish spots. 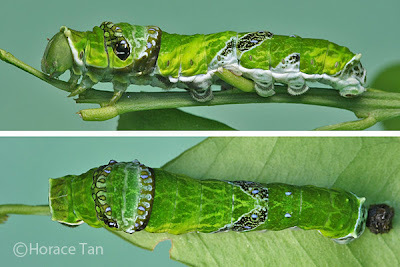 The 5th instar lasts for 9 days, and the body length reaches up to 55-60mm. 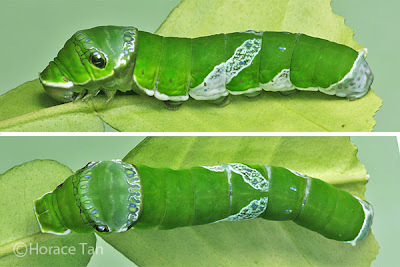 Toward the end of this instar, the body gradually shortens in length. 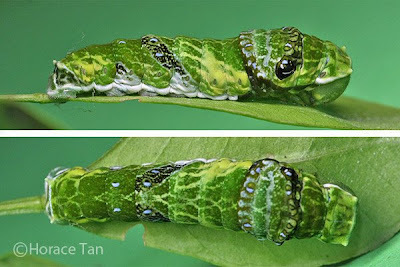 Eventually the caterpillar comes to rest on the lower surface of a stem and becomes a pre-pupatory larva. A pre-pupatory larva of the Great Mormon, with silk girdle not yet done (left)l and completed (right). Pupation takes place a day later. 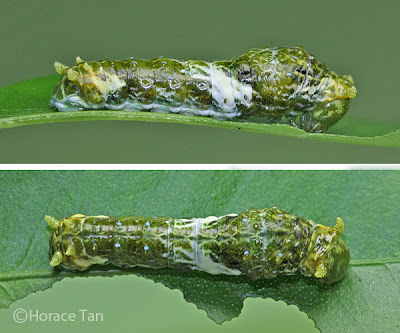 The pupa suspends itself with a silk girdle from the stem. It is mainly green with large yellowish markings. 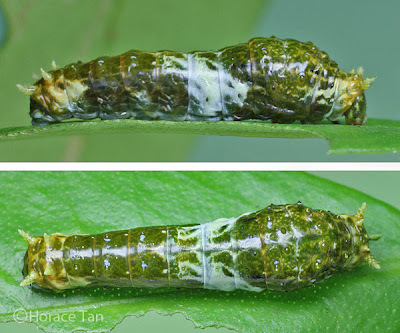 The pupa has cephalic horns, a dorsal thoracic hump and is angled in side view. 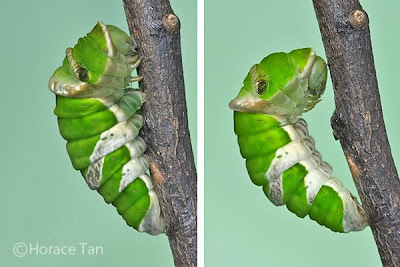 Length of pupae: 37-38mm. 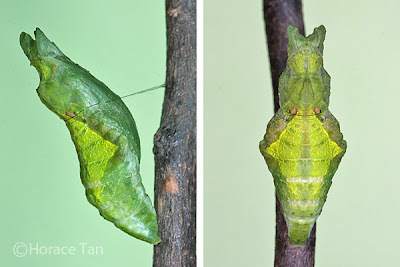 Two views of a Great Mormon pupa. 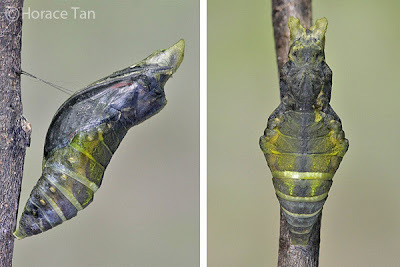 After 10 days of development, the pupa turns black as the development within the pupal case comes to an end. 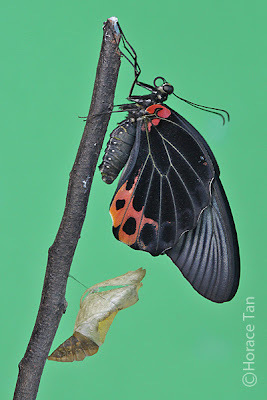 The next day the adult butterfly emerges from the pupal case. 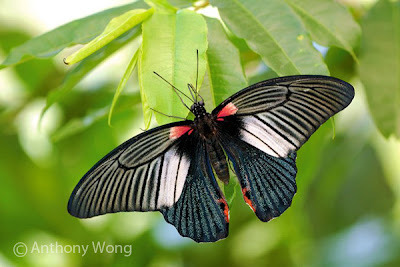 The beautiful undersides of its wings are fully displayed as it dries its wings for the first few hours after eclosion.